The woman who called herself Ragini Devi was born and raised in the middle section of the North American continent, in the late 19th/early 20th century. Her name at birth was Esther Sherman, and her family heritage was a mixture of German, Anglo-Canadian, and Yankee. She grew up canoeing, playing piano, eating locally hatched eggs, and buttoning herself into lace dresses—inhabiting an unexceptional white, female, American body, and belonging to a typical white, middle-class, midwestern American community. But sometime before her 20th birthday, Esther Sherman moved to New York City and, for reasons we can only guess, adopted the fictional persona of Ragini Devi, a self-described Kashmiri Brahmin who had studied sacred dances in the caves of Tibet. 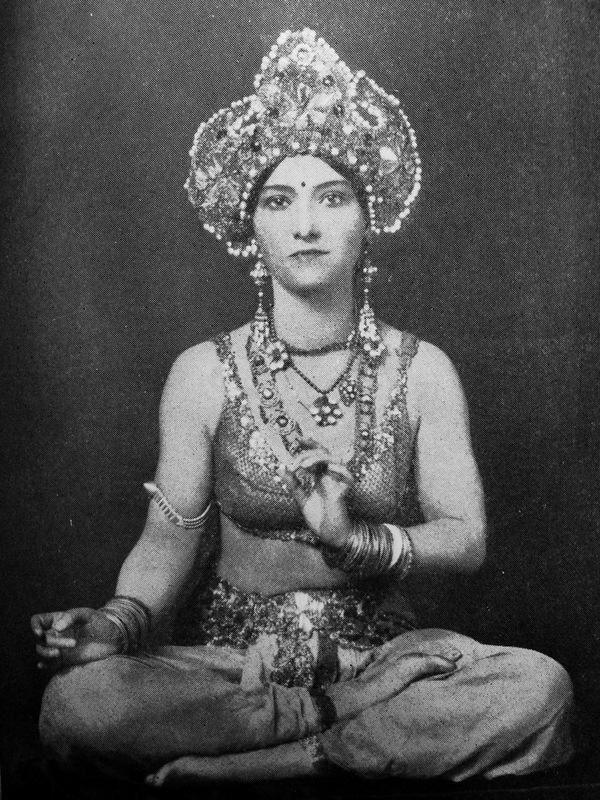 Throughout the Jazz Age (or, at least from 1922 to 1929), Ragini Devi regularly presented performances of what she called “Hindu dances” on New York’s minor stages. She danced a “Temple Nautch” dance, an “Ecstatic Dance of Krishna”, a “Celestial Nymph Dance”, a “Fakir’s Song”. Doing so, she earned admirers (and detractors) among local dance critics, beauty columnists, photographers, and theatre-goers. The New York Times raved that Devi’s act featured “beautiful plastic poses accompanied by sinuous serpentine movements.” The New York Sun cheered the “rare exotic effect” of Devi’s dances, which were “rich in [their] suggestion of sensuous and spiritual significance”. The New York American declared that “Ragini seems to reflect all the mystery and lore of the high-caste Oriental woman”. Devi’s story rarely makes an appearance in critical surveys of US or Indian dance history. She left behind no company or cohort of devotees, had no discernable influence on larger-than-life figures like Martha Graham or Rukmini Devi, and her choreographies are rarely studied, written about, or re-performed. At best, she appears in an occasional off-handed remark, a footnote, or a novelty. But the story of Esther Sherman’s invention of, and performances as, Ragini Devi holds within it valuable information about the ways in which dance history intersects with, and can contribute to, our understanding of the history of racial and national ideologies. Maybe we can glimpse within Devi’s dancing body—and within the stories she deployed to describe it—a collection of ideas about how the dancing body reflects, contains, and reinforces ideas about racial difference. Perhaps Ragini Devi’s performances of “Hindu dance” offer us a new vista on old questions about the normative Self and the invented Other. Perhaps her body might be viewed as an archive of the racial fantasies that sit at the heart of whiteness. If the dancing body is an archive, then we have only limited access to the repository that was Ragini Devi’s: there remain no moving images to bear witness to her gestures, or to her body in motion, on-stage or off. But we can glimpse her body, her gestural vocabulary, and her physical ideas in the photographs, reviews, interviews, and writing she left behind. Ironic though it might seem (given her efforts to transcend her birth-identity), Devi’s body was a living, gesturing repository of what historian Barbara Fields calls the “ideology of race”—that is, of a belief in its “biological reality.” This belief shaped Devi’s work as choreographer, performer, and self-promoter; it also appeared in her writing. Indeed, her claim to authenticity depended on it. In her book Nritanjali: Hindu Dancing, Devi wrote, “The dance expressions of different races are in a sense race modes or the plastic embodiment of a race spirit”: Swedes possess the “vital race-spirit of Scandinavia”, Mexicans have “a quaint and simple charm”, and Hindus, she wrote, have a direct connection with “the mystic rhythm of the Universe”. What the minstrel show did was capture an antebellum structure of racial feeling...which Americans only dimly realized they felt, let alone understood. The minstrel show was less an incarnation of age-old racism than an emergent [set of performances that were] highly responsive to the emotional demands and troubled fantasies of its audiences. Esther Sherman’s performance of Ragini Devi and of “Hindu dance” was not a minstrel show. But like the minstrel show, it did serve as a response to “the emotional demands and troubled racial fantasies” of 1920s-era American whiteness; and it did capture a “racialized” set of “thoughts and feelings” that white Americans were only just beginning to perceive. Ragini Devi’s invention and rise to popularity occurred at the very moment that the US government was officially sanctioning “Hindu” as a racial category and declaring all members of that category ineligible for naturalised US citizenship. Even in an era full of hysteria over the generalised threat that immigrants posed to the nation, the US government’s efforts to exclude and marginalise the (very small) population of Hindus living in the US was a notably brutal one. After restricting all immigration from Southern and Western Asia (in 1917), the US denied “Hindu” immigrants the right to naturalise (1923). Subsequently, the federal Bureau of Naturalization undertook an entirely unprecedented (and probably illegal) campaign to strip US citizenship rights from all “Hindus” who were already naturalised as citizens. All the while, Devi’s reputation as “a native exponent of Hindu dances” soared. As such, we might view the archive that is Ragini Devi’s body as a window onto white Americans’ efforts to make sense of racial exclusion, the category “Hindu”, and the reinscription of a normative ideology of national whiteness in 1920s-era US. A great deal of writing about the dancing body as an archive offers a vision of the freedom that such a frame offers. Andre Lepecki writes, for instance, that conceiving of the body as an archive “diverts notions of archive away from documental deposit or bureaucratic agency dedicated to the (mis)management of the past” and helps us understand deeply personal experiences with “time, presence, identity alterity, body, memory, past, future, subjectivity”. But we might also view the dancing body as an archive of structures of racial feeling, or the emotional demands and troubled fantasies of a collective, a nation, in times when racial exclusion and white supremacy was on the rise. And if Ragini Devi’s body was indeed such an archive, it certainly was not the only one of its kind. She is not completely absent from the historical record, however. She appears occasionally in scholarly considerations of history of Indian dance in the the 20th century; and upon her death in 1982, noted dance critic Anna Kisselgoff wrote her obituary for the New York Times. Her granddaughter Sukanya Rahman also told her story in Dancing in the Family: An Unconventional Memoir of Three Women (Rupa Press: 2004). Published in in 1928, in New York City, by Hari G. Govil, Inc.
 As Edward Said long ago demonstrated, Asia and Asians have long stood as a primary referent by which Westerners have come to know themselves. “European culture”, he argued in Orientalism (Vintage: 1979), “gained strength and identity by setting itself off against the Orient as a sort of . . . underground self”, pp. 3 & 7. Laura Browder, Slippery Characters: Ethnic Impersonators and American Identities (University of North Carolina Press: 2000), p 2. Eric Lott, Love and Theft: Blackface Minstrelsy and the American Working Class (Oxford University Press, 1993), p. 6. Rachel Mattson works at the intersections where archival practice meets queer political and aesthetic desire. She currently works as the Manager of Special Projects in the Archives of La MaMa Experimental Theatre Club, and is a core member of both the XFR Collective and Librarians and Archivists with Palestine. She holds a PhD in U.S. History from NYU (2004) and an MLIS from the University of Illinois, Urbana-Champaign (2014). Her writing has appeared in the Radical History Review, the Scholar and the Feminist, Movement Research Performance Journal, and in books published by Routledge, Washington Square, and Thread Makes Blanket Press.